Since 1982, Graziano Roofing has installed hundreds of roof systems on homes in southern California, earning its place as the roofer of choice for many of the area's leading builders. In 1988, Graziano Roofing expanded to Texas and built an equally impressive reputation in that market. We're proud to recommend Graziano Roofing for the most complicated roof system installations. With three decades of experience in manufacturing, designing and installing sheet metal products, the experts at Custom Copper offer extraordinary attention to detail and truly superior ability for even the most challenging installation. From curved applications to geometrically daring designs, the company can handle it all. And, as you may expect, copper applications are their specialty. Bursting with relevant and interesting commentary, pictures, videos, Q&As and more, all focused on the metal roofing industry. Subscribe today and stay in the loop! This is our original metal roofing blog and while we don't update it anymore, it's filled with several years' worth of metal roofing Q&As, industry observations, before, during and after photos of some of our metal roofing projects and more. Enjoy! With its copper roofing only focus, this is the blog to check out if you're considering a new copper roof in any profile. You'll find copper roofing pictures, descriptions, observations, article links and more. A fabulous website for anyone tackling a home improvement project, we're proud to be featured in Houzz's professional section as a supplier of premium metal roofing, including our specialty, copper roof materials. This is an excellent resource for all aspects of home improvement and definitely worth a look. Check out our page, then take some time to browse the rest of the site! A purveyor of the innovative "backyard cottage," New Avenue Homes combines incredible design, green building expertise and financial resources to create completely self-sufficient, incredibly stylish and ultra-green little homes. From extra space for a loved one to an income property or just as an option for downsizing, this should be your go-to small home company. And check out the great metal roofs! 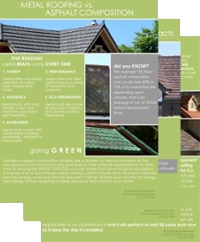 A fantastic resource for homeowners beginning the re-roofing process, this company offers a comprehensive report for your specific roof that includes detailed aerial measurements and exact prices for a variety of materials and project conditions, plus tips for negotiating the best deal with the contractor of your choice and more. It's valuable information to have before speaking to any roofer. A wonderful and historic family-owned winery in St. Helena. We supplied beautiful reclaimed copper shingles for the Civil War-era barn that once housed the family's original wine-making equipment. A beautiful family-owned winery near Santa Rosa. We supplied custom-curved copper panels for this distinctive winery. Big thanks to our friends at BDG Web Design for everything they've done for us! Like the new website? This is who made it happen! If you've got an interior design project in the Bay Area, this is the woman to call. We supplied beautiful copper shingles - a mix of hand-treated and those left new - for her personal residence, so you know she has excellent taste!